Hey everyone! I’ve been excited to start this series for a while now (click here for a rundown on how Recipe Showdown works), and what better way to start than with chocolate chip cookies? Everyone and their grandma think that they have the best recipe for chocolate chip cookies. When you google “best chocolate chip cookie,” you are bombarded with over three million results. 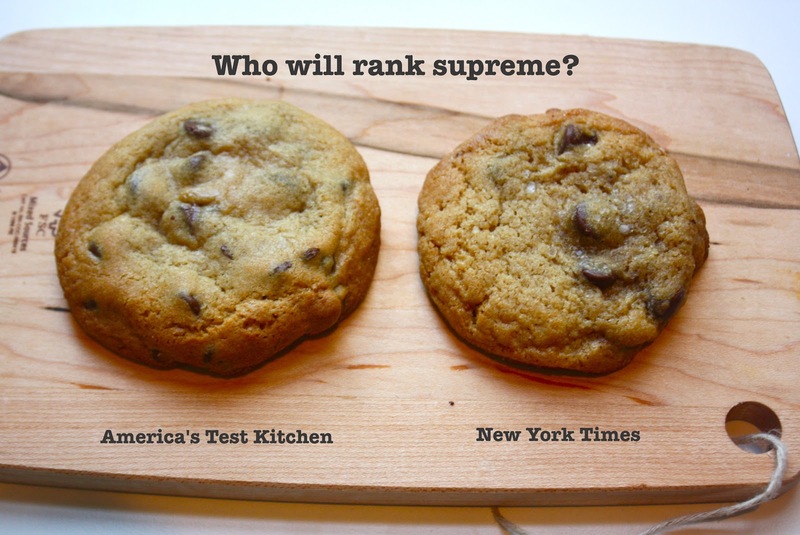 Three million people cannot possibly have the best chocolate chip cookie recipe? Can they? Despite my love for chocolate chip cookies, I couldn’t test all three million of them. 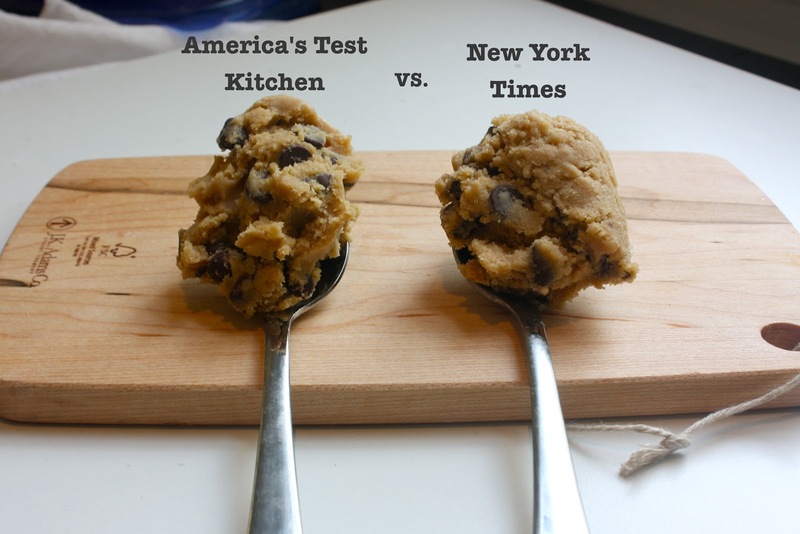 I did a little bit of research and found out that the top two recipes among food bloggers were America’s Test Kitchen’s Perfect Chocolate Chip Cookies, and Jacques Torres’ Secret Chocolate Chip Cookie Recipe from the NY Times. Both of these come from reputable sources, and both have convincing evidence that they are indeed the best. Thus the testing begins. Literally just made these yesterday. AMAZINGGG! Try Alton Brown's "The Chewy" chocolate chip cookies. They are awesome 🙂 I ended my search with those over 5 years ago! Awesome thanks so much, I still have the Jacques Torres dough in my fridge — maybe I'll put it against the Chewy! Oh wow that would be amazing, please email me if you make a "combo" recipe, I would love to try it out as well! Love this post – The cookies look amazing! I'm just popping in to remind you that The October Three Ingredient Teen Recipe Challenge e-mails have been sent out and Erika and I have both voted for our category. It'd be great if you could respond ASAP so we can start brainstorming! Thank you so much! Which e-mail address did you send it to? Could you possibly re-send it to cannellavita@gmail.com? I love recipe showdowns. I used to work in a bakery and it was one of my favorite things to do. The best one I did involved comparing 6 different batches of brownies side-by-side when we decided to revamp the bakery's basic recipe. We ended up picking a recipe off All Recipes that starts with melted chocolate and adds whole chocolate chips over those with cocoa powder and nuts. David Lebovitz's gluten free brownie was a close second. I'd be curious to see what recipe you would end up choosing for brownies. WOW that sounds great, before I started recipe showdown, I compared David Lebovitz' and the Baked brownie. Could you send me the link to the All Recipes recipe? I think this may be a future showdown! I love recipe showdowns! They are great! Jacques Torres' recipe was my go to for a while, before I discovered this recipe. Without question, family and friends (and I) prefer this recipe over his. 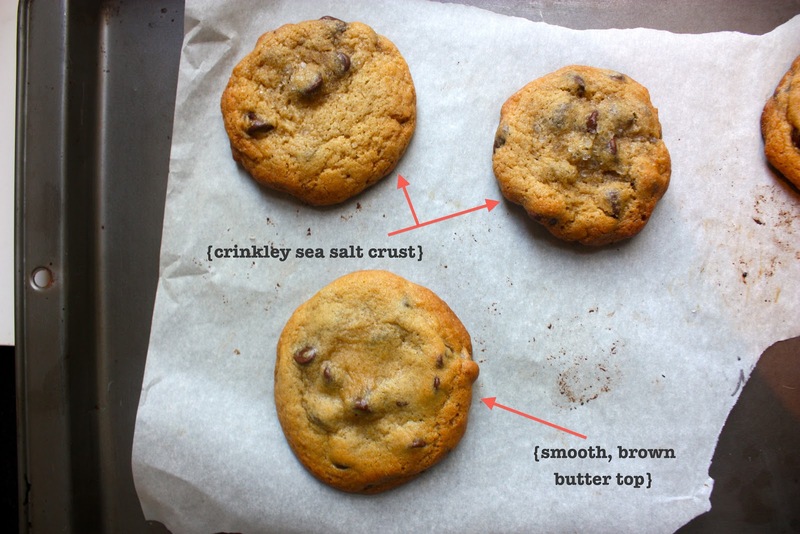 I didn't think it was possible to improve the cookie, but this recipe gives a lightly crisp outside, buttery, chewy inside. Let me know if you try! Thank you so much! This recipe is in my queue to make!